When you have a car that looks fantastic, you want its home to look fantastic too. If your car maybe doesn’t look all that fantastic, then you want something to hide it. Either way Modern Garage Doors has revolutionised the market by giving Australians a real choice. Modern’s sectional Garage Doors look fantastic and come in a variety of colours, patterns and styles to complement any home and architectural style. The sectional panels are designed with wood grain-textured finished and come in 5 standard colours Off White, Wheat, Slate Grey, Smooth Cream and Merino. Plus 3 Heritage colours that give a charming wood-look finish Oak, Jarrah and Cedar. The sectional doors are strong, durable and resist corrosion making them ideal for Aussie conditions. They’re also quieter because the opening operation is smooth, thanks to the nylon polymer hinges that reduce metal on metal friction and the brush seal also keeps water out. In South Australia, you’ll be more familiar with Modern as Bramalco. Until Modern or Bramalco, you could choose either a roller door or a tilt door. 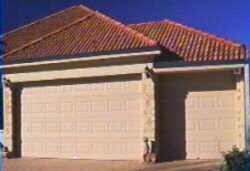 Both have their problems but Modern Garage Doors are one of Australia’s safest doors because they lift vertically & feature “fingersafe” technology. A Modern Garage Door will fit perfectly, because each is custom made for its new home and there are four design options. The remote control for your Modern Garage Door can be programmed to operate other doors and alarms as well. For more information on Modern Garage Doors give Modern or Bramalco a call.